Few robots achieve the same legendary status as MEGATRON , but DARKMOUNT is one. He is just as famous on CYBERTRON as the impenetrable fortress that bears his name. From there, he ruled his small corner of the machine world with an iron fist, controlling his subjects with an equal measure of fear and pain. So terrible was his rule that even MEGATRON gave him a wide berth, and treated him with the respect due to an equal. A Straxus toy? You're kidding, right? No, really. This has to be some sort of extended practical joke. Stop pulling my leg. There's no way Hasbro would ever make a Straxus toy. That's crazy talk. Well, they actually did. Even with him perched on my desk alongside the likes of Megatron and Cyclonus, I still have a hard time believing that it actually exists. For those of you who haven't read the Marvel Transformers comics from the 80s, Lord Straxus was one of Megatron's successors, a small-minded tyrant who ruled over the city-state of Polyhex. In the early years of the line there were very few Transformers and all of them were still available on the toy shelves, so Hasbro was understandably unwilling to let any of them be killed in their comics. Straxus was created to fill that void, serving as a villain in the issues that introduced Blaster and his team and dutifully dying once his purpose had been served. He showed up in the UK comics a lot more, but never in one piece -- he was either a disembodied head or trying to possess Megatron. He managed to pop up a few times in the background of the modern IDW comics, but to 90% of the fandom and the toy-buying public at large Straxus is virtually the definition of 'obscure nobody'. The very idea that he'd get a toy before popular fan favourites like Jazz or Kup or the Insecticons is laughable... but not unwelcome at all. Since the name 'Straxus' wasn't available Hasbro named this figure 'Darkmount' after the fortress that served as the base for his reign of terror in Polyhex. I'll refer to him as Straxus though, because that's what I've been calling him for twenty years and the name's not getting out of my head any time soon. 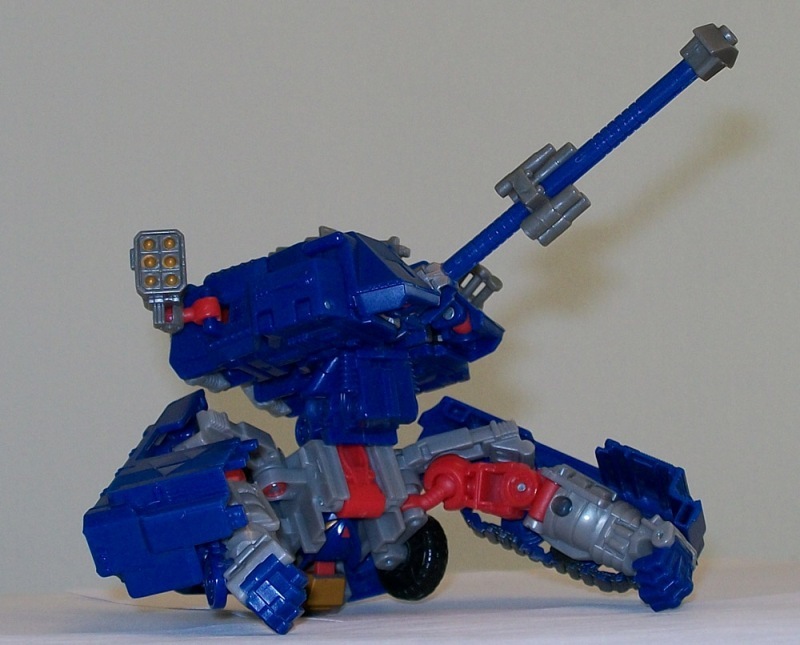 In the comics, Straxus transformed into a truly bizarre flying artillery piece that bore no particular resemblance to his robot mode. There was no way that Hasbro was going to be able to render that in toy form and they didn't even try. The other modern reinvention of Straxus stuck to the 'flying' part and turned him into a bat-winged jet. Hasbro decided to run with the 'artillery' angle, giving us a Straxus that transforms into a half-track self-propelled artillery (something that's easy to misidentify as a tank). It doesn't have much of anything in common with either of his previous vehicle forms, but it's somehow fitting all the same. Straxus is mostly blue, a completely unrealistic shade for a military vehicle that actually looks pretty good regardless. He has silver paint on his cockpit and headlights as well as a silver 'M17' (referencing his first fictional appearance in Marvel #17) lettering on his turret and forward armour. The middle third of his front section is gold, his treads are painted grey and grey plastic is used for the tip and base of his barrel, his auxiliary weapons and a few other bits and pieces of his turret. Finally, a few red clips and joints are visible on the turret as well. The overall look is about as un-military as you can get, a complete departure from the design philosophy that gave us an almost completely-grey tank mode Universe Galvatron for the sake of realism. It works very well, though -- the dark blue is very distinctive and (combined with the gold on his front end) makes for an easily-recognizable deco that makes you think 'Straxus' right off the bat. He's not without his flaws, though. Straxus's turret is very, very big compared to the rest of his vehicle mode, almost comically so when he's stacked up against Galvatron or the Classics tank Megatron. That seems to be par for the course as far as turreted self-propelled artillery goes, but usually not to quite the same extent. This is a flaw in his transformation scheme, more or less -- his turret will unfold into his robot-mode legs, and his legs are very bulky. Straxus is pretty heavily-armed in vehicle mode. Aside from his main cannon (presumably a howitzer that he can use to bombard far-away targets) he's also got a pod of six (non-firing) rockets, a small antipersonnel machine gun and another pod with three (also non-firing) smoke grenades. He also features a...thing mounted on his main barrel. I'm not entirely sure what it is, but it features four differently-sized barrels of its' own and slides freely from the base of the cannon to the end. It could be intended as a coaxial weapons system (something that real-life tanks frequently use on their main gun) but it doesn't really look like anything and honestly it just gets in the way. The three smaller weapons (the rockets, grenades and machine gun) all attach to Straxus by means of 3mm clips mounted on ball joints. 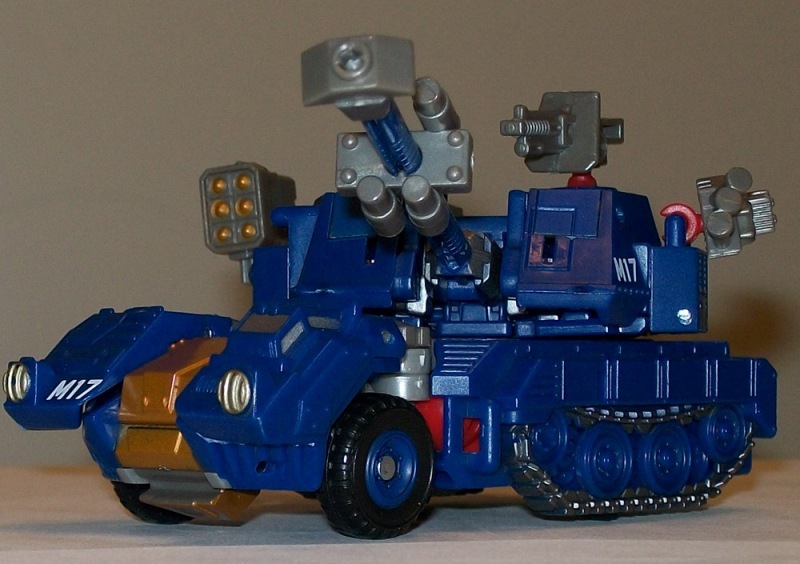 Straxus has at least nine possible mounting spots for the guns (seven at various places on his turret and two between his tracks and wheels), so you can mount them wherever they look best to you. It also adds some flexibility if you plan to buy both Straxus and his remold Skullgrin, because you'll be able to give them slightly different vehicle modes by moving the gun pods around. The guns themselves are kind of cutesy and a bit too big for him, but because he's already so unrealistic-looking I don't mind. If you decide you don't like him, though, a fair number of modern Transformers come equipped with the mounting points you need to hold them. His turret swings freely 360 degrees and his barrel can either elevate up to 45 degrees or depress five to ten degrees, giving him a very good field of fire. Straxus also features a secondary alternate mode, a more traditional tripod-mounted artillery cannon. They evidently didn't think much of it though, since they don't advertise it on his box at all and only mention it in his instructions. I don't think they were wrong either, because it's completely forgettable and looks like nothing more than a half-way point between half-track mode and robot mode. The colours and play features are generally the same, but with the added negative of his robot-mode arms being blatantly visible. I do my best to pretend this mode doesn't exist, and evidently I'm doing pretty good -- I totally forgot about it when I was taking pictures and had to go back to get a shot of it. All in all, Straxus has a nice alternate mode. It's not exceptional, nor is it what he turned into in the 80s, and his third mode is completely worthless. He's a fair bit of fun though, and this toy represents the character's "Earth mode" pretty well. 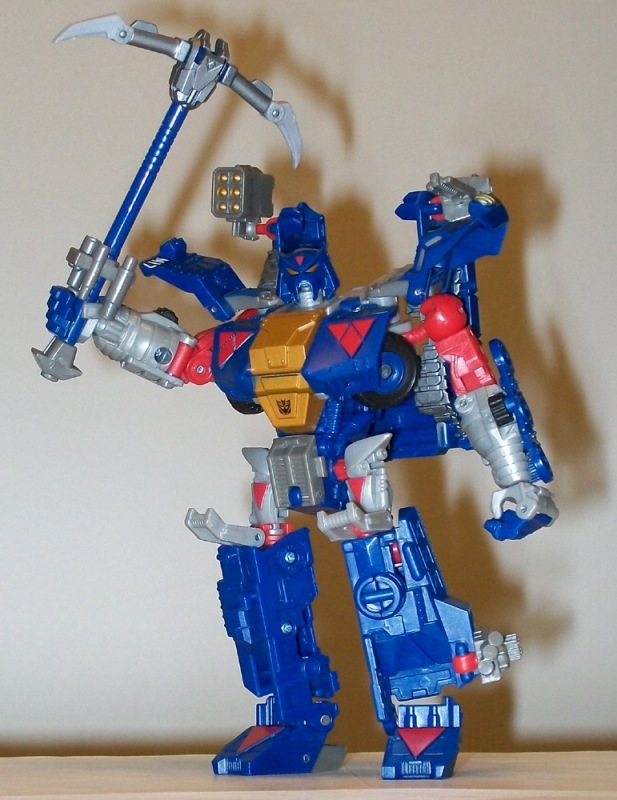 Straxus has never had a definitive robot mode design or colour scheme. He alternated between blue, grey and red and blue, grey and gold (the precise colours and layout changing from book to book and even panel to panel -- good show, Yomtov you hack!) in the Marvel books, with a fairly generic bulky body and a distinctive cobra-like head. IDW's Straxus was different too, featuring more detail and a more normal head with an actual face. The Japanese version of the toy seems to emulate the version of Straxus that we saw in Marvel issue #18, but Hasbro got a bit more creative, mixing and matching elements from several different designs. His forearms, thighs and a few other pieces are grey, while his shoulders and biceps are red and the middle of his chest is gold. A small black Decepticon symbol decorates his belly. The rest of him is almost entirely blue, but inverted red triangles are painted onto his pectorals, feet and thighs to break up the monotony. His head (a very faithful rendition of his very alien Marvel head) his gold eyes and a red triangle on the forehead, but is otherwise pure blue mounted onto a grey neck. He looks good and he looks like Straxus, something that I never, ever expected to say about a toy. He has a few niggles though. His thighs are very, very tiny, less than half as long and wide as his shins...a common problem with recent Transformers, I find. he also as a big, hollow backpack made up of his treads and the rear of his alternate mode, which just hangs off of his shoulders and doesn't really do anything. His lower thighs (where his feet go as a tank) are practically hollow too, which I thought I would hate based on the stock photos. It turns out that the holes are usually shaded so much that you can barely tell that they're there, though. Straxus can use his clip-on weapons in robot mode as well, although attaching them to the clips on his legs looks a bit silly. Two of them can mount on clips on his backpack and point out over his shoulders, but the third one has nowhere to go but the legs. He also comes with his trademark melee weapon, rendered as a pickaxe rather than the odd mace/scythe hybrid that he had in the comics. He can hold the weapon in either a one- or two-handed grip and looks very good doing it. Unfortunately, since the weapon is made up of his vehicle-mode cannon you need to deal with that unclassifiable sliding thing getting in the way no matter what you do. Frankly the toy would be better off if that piece hadn't been included at all, since it detracts from both modes and serves no real purpose. Straxus is so big and bulky that at first glance you'll probably assume that he's not very posable. However, nothing could be farther from the truth. In fact, he has more joints than you would expect on an average Voyager, let alone a Deluxe. His arms alone have seven points of articulation each (three in the shoulder, two in the elbows, ball-jointed wrists and opening hands). That lets you pose him in all sorts of neat positions using his pickaxe, something that I really appreciate when a Transformer comes with a melee weapon. He also features a swiveling neck, adjustable shoulder pads, a swiveling waist, ball-jointed hips, universal-jointed knees and surprising but very welcome ball-jointed ankles. Straxus is very top-heavy and could have been a chore to even stand up (hello, Universe Prowl! ), but his sizable feet combined with ball jointed ankles make him exceptionally stable. Straxus is just a great toy in this respect, and I'm struggling to find a single thing to complain about -- not even his unsightly backpack gets in the way of posing him. Straxus's big, beefy robot mode doesn't really resemble the generic block of a body that he had in the comics. The general idea is the same, though. He's got enough bulk that the silhouette is similar, and the deco pattern and head add to the effect. He looks very much like Straxus and I wouldn't be surprised if this became the definitive depiction of the character in the years to come. Like the toy itself, that development wouldn't be unwelcome at all.